Why is the insurance putting used parts in my car after an accident? Some people are frustrated by the use of used parts to repair their vehicle after an auto accident, especially when they were not at fault. They might suspect the shop was trying to save money at their expense. This kind of logic is hard to hear when it’s someone else who caused the accident. Unfortunately, this is the compromise the law makes to prevent exploitation of the system from either side. Having a good relationship with your repair shop and choosing one that will advocate for you is how you can best work within this system. To see how this works, understand there are four players at work in this scenario. The first two are you and the repair shop, advocating to restore the vehicle to its previous condition. The third player is the insurance company paying for repairs that wants to minimize its costs. The fourth player is the vendor selling the parts to be used. When repairing your vehicle with used parts, the shop can still demand the part meets certain specifications. This balances the insurance’s right to use used parts with your right to restore the vehicle to its previous condition. If the part bought by the insurance company does not meet specifications, the shop has the right to reject it. The insurance company then has a choice: do they try another used part, or just provide a new one. They may try another used part and, if it does not meet specifications, it could be rejected again. 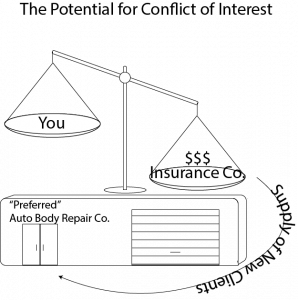 This back and forth process can start costing a dangerous amount of money and resources for the insurance but also possibly you. While waiting on parts to ship, your car is accruing costs for storage at the shop which increases the bill daily. If there is rental coverage, you’re costing the insurance money using your rental as well. However, the shop may not have the space to keep your car waiting. And you probably would prefer to have your car back and not deal with the hassle. So, this is a game of chicken that can be frustrating on both sides. Sometimes, the third player in this game, the parts vendor, can bring about an easy solution. If the shop has a good relationship with the vendors, some are willing to discount new parts to the rate of used parts. In this situation, the shop gets a part in the right condition and the insurance gets the cost they feel is appropriate. Who does the shop work for? You or the insurance company? Fighting for quality parts can take more time and energy. If the body shop is working for you, this is an investment they can make because it pays off when they earn business based on their reputation. These are the types of shops we work with and refer clients to. Compare this ethic to a “preferred” shop that relies on referrals from the insurance companies to gain clients and make money. The insurance company’s goal is to have a car repaired at a minimal cost. If rejecting a part causes a delay that costs more in rental car cost and shop storage, there may be some hesitancy by the preferred shop to take that risk of losing preferred status. Or, the company may reduce other costs to balance the cost of the delay. The risk to you is that if the shop feels more accountable to the insurance company than to you, the insurance’s goal of minimizing cost is going to overpower your right to have the appropriate parts or process when repairing your car. Or, that the cost of the total repair will not reflect the true damage to your vehicle. You might ask, “Wait, if they gave me what I want and discounted the cost, why is that bad?” In a world run on common sense, that would be fine. But, again, it comes back to the insurance company being driven to reduce expenses at all costs. This includes paying you as little as they can for any diminished value claim or personal injury claim you might also make. What has my car repair cost got to do with my personal injury or diminished value claim? So, now that you have used the shop they recommended, that shop quickly repaired the vehicle at a deflated price to make room for more insurance referrals, you cost them less by using a rental for less time… instead of rewarding you for keeping those costs low, they may use that as an excuse to refuse payment on injury. Diminished value claims can also be undermined when a repair shop doesn’t advocate for you. Diminished value claims are a way to recover the lost resale or trade-in value due to the accident. The true diminishment amount is unique to each vehicle and situation. However, most insurance companies have a formula that takes the amount of property damage and prior condition of the vehicle into account. If the shop is pressured by a relationship to the insurance company to say the parts were already in worse condition to accept a used part, the combination of lower value of the car and cheaper part replacement cost is going to have a compound effect to lower your estimated diminishment. In short the argument is, “your car didn’t lose much value because it was already worn out and it didn’t have that much damage anyway.” A diminished value appraiser can answer these arguments with a detailed report and possibly discovering faulty repairs that need to be redone. But now you’ve lost time and the argument may be harder to make to get you compensated appropriately. You may even be stuck litigating the matter to finally get a fair appraisal of your loss, but that process can take years. So, it is best to get out ahead of these potential problems. Working with a shop that has a good reputation of serving its customers is a solid way to protect yourself from getting used parts that are below the quality appropriate for your vehicle. 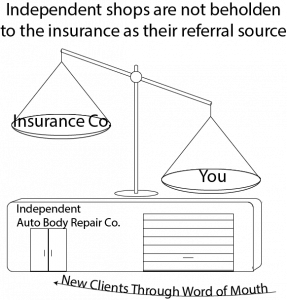 When the shop is more accountable to you than the insurance company, you can be assured the total damages will be addressed appropriately at a reasonable price. This protects you for an injury or diminished value claim you might later make. It also rewards the shop for doing a good job on the repair, rather than doing a good job of cutting corners and costs. When getting your car repaired after an accident, you may have to compromise and accept some used parts due to your duty to mitigate damages. However, in working with a shop you trust, you can ensure the parts used on your vehicle will meet the acceptable standard to work as effectively as the part being replaced. Or, the shop’s ability to reject poor quality parts and relationship with vendors may make it possible to get new parts at a price the insurance company will accept. We have several shops we work with across the valley that have proven their ability to do excellent work for the customer. One of our priorities for clients is getting their vehicle repaired quickly and effectively. A quality shop helps you get your vehicle back in the best possible condition as soon as possible. We can also count on these shops to record the repairs appropriately and coordinate with any diminished value appraisal we may need done. Their precise work gives us the best possible foundation for making an injury or diminished value claim afterwards. If you are taking care of property damage after a car accident on your own and are worried about used parts, we highly recommend finding a repair shop with a reputation for customer service. If you’d like to get your vehicle repaired and also pursue a claim for personal injury or diminished value – or if you are unsure and you’d just like some information to determine how you’ll move forward – call us for a free consultation with an experienced accident attorney to analyze your case. We are happy to look it over with no obligation. If you have been in an accident in Scottsdale, Tempe, Mesa, Gilbert or elsewhere in the East Valley we can meet you in our Tempe office. If you live in the West Valley we can also meet you in our Peoria or Surprise offices to discuss your personal injury or diminished value claim.